Burnley will check on winger Johann Berg Gudmundsson’s fitness ahead of Saturday’s key clash with Wolves at Turf Moor. The 28-year-old came off in Iceland’s 2-0 win in Andorra in their opening Euro 2020 qualifier last Friday. And he did not feature in the 4-0 defeat against World Cup winners France at the Stade de France on Monday. 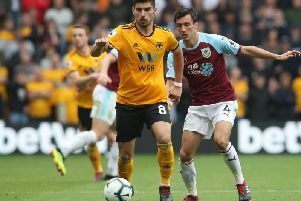 However, boss Sean Dyche has been boosted by a clean bill of health for his other internationals, with the likes of Robbie Brady getting some welcome game time under their belts. Dyche said: “We’re waiting on more news on Johann. “He had to come back with a minor calf injury, so we’ll have to wait and see. Brady hasn’t started for Burnley in the Premier League since December 8th, at home to Brighton, but got the nod on Tuesday night as the Republic of Ireland beat Georgia 1-0 in Dublin. He also got half an hour as a substitute on Saturday as Jeff Hendrick’s goal proved the winner in Gibraltar. Brady has seen his opportunities limited by the form of 19-year-old Dwight McNeil, who picked up his first two England Under 20 caps over the week, having also been invited to train with the senior squad last Tuesday. Dyche was thrilled: “We’re delighted for Dwight, and he’s certainly deserved it. “He’s showing all the things you need to show, not just in his performances. “I stay away from the lads when they are away, but I texted him and he said he really enjoyed it and thought he did well going into that environment.